A large number of Metchosin species have been located during the six years of the Metchosin BioBlitzes and MycoBlitzes. Our species count edged over the 2300 mark in 2016. Here is the summary of our counts at the beginning of 2017, broken down by organism groups. You can view the entire set of observations--more than 10,000--by species group and by scientific name. You can also download an Excel spreadsheet of all of our data (but with specific observation locations removed). 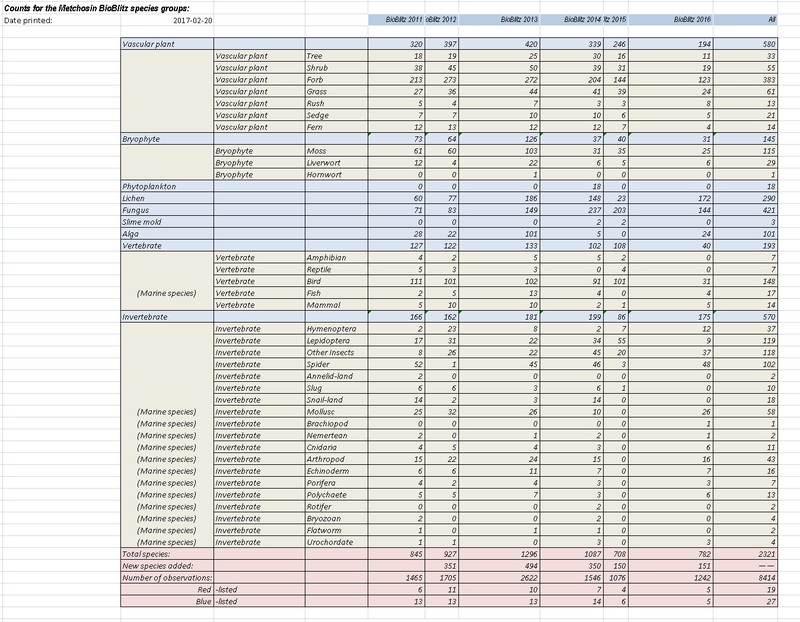 The spreadsheet was updated in May, 2017. Species counts continued to mount during our various 2017 blitz events (described below). At the end of 2017, we were within a few species of reaching the 2400-species plateau. The 2017 MycoBlitz group. Picture by Luke Mikler. Click for larger version. 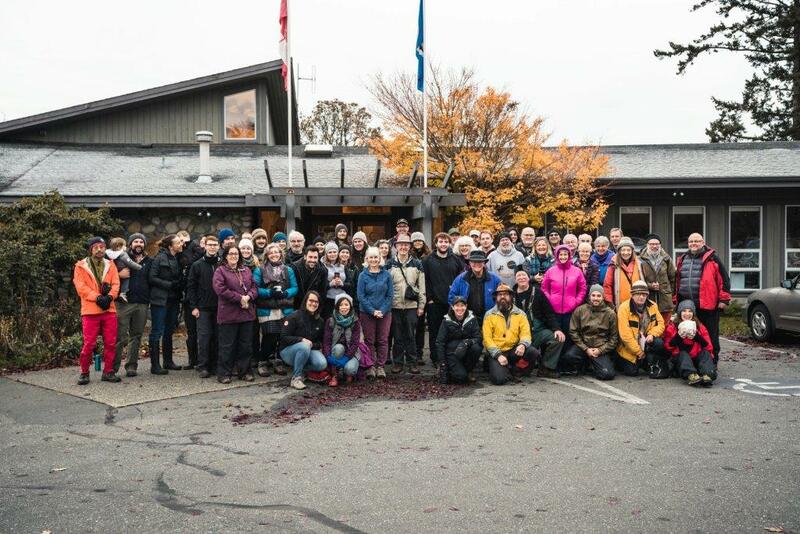 The fifth Metchosin MycoBlitz took place on Saturday, November 4, 2017. A sharp frost and a light snow on Friday, combined with an unusually bad year for mushrooms in general, had us wondering whether we would find much at our fifth MycoBlitz event. A record crowd showed up, however. Twenty experts and almost forty visitors brought back over 200 mushroom samples. Of these, 155 were different species. 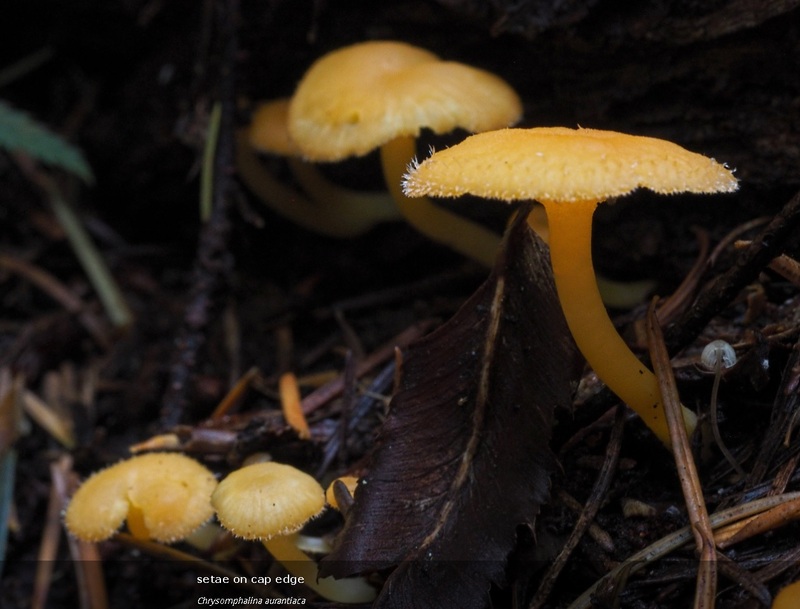 45 of these species (listed here) turned out to be new to Metchosin BioBlitz/MycoBlitz records. The large group, which met in front of the District of Metchosin offices, divided into three teams. Mushroom identification experts were dispersed among the teams. 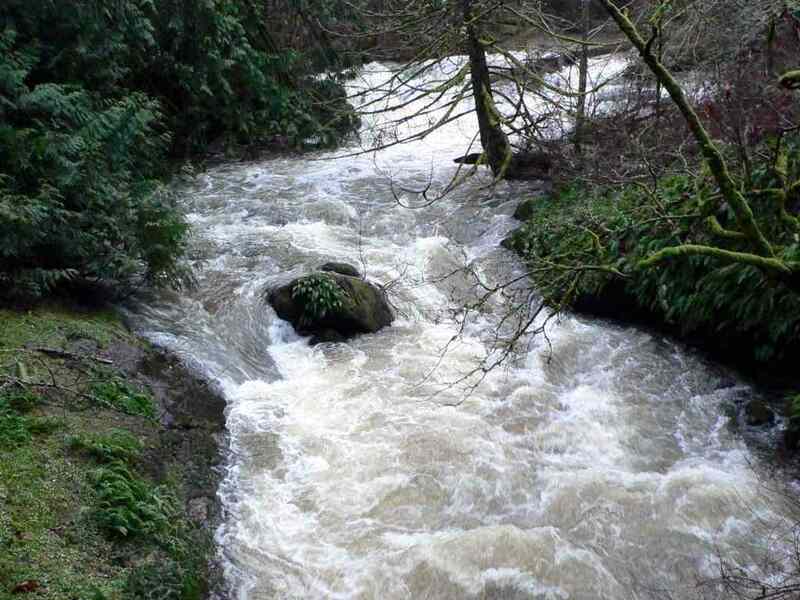 The teams were assigned to travel to three Metchosin locations: Camp Thunderbird, Pearson College, and Camosun College's van der Meer property. (A big thanks to the YMCA-YWCA, Pearson College, and Camosun College for allowing the teams onto their properties.) The teams left about 9:30 am and returned to the starting location about noon. 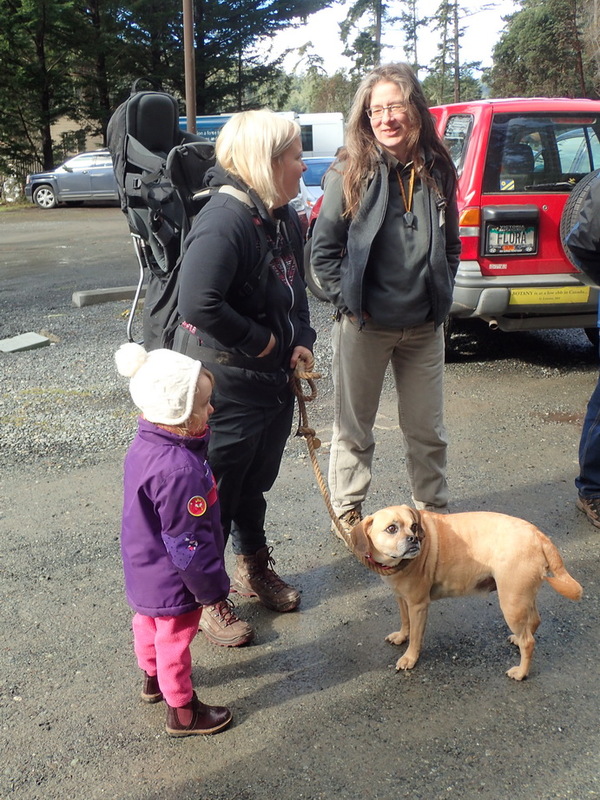 MycoBlitz planners Moralea Milne and Joel Ussery stayed behind to prepare for the return of the groups. Chrysomphalina aurantiaca, a small forest beauty. Picture by Roger St. Pierre. Click for larger version. The Camosun team finds a clutch of edibles--deer mushrooms, Pluteus exilis. Picture by Luke Mikler. Click for larger version. The speaker and resource person for MycoBlitz 2017 was Dr. Roo Vandegrift of the University of Oregon. 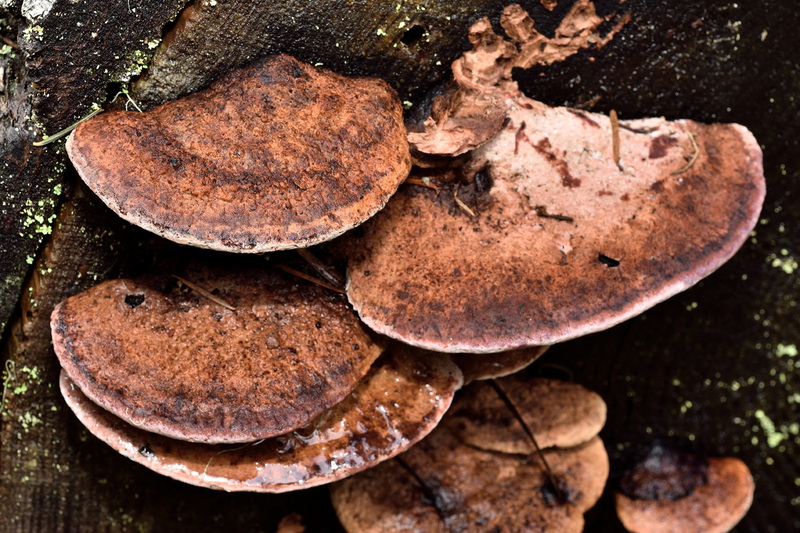 His talk in Metchosin on the Friday night before the MycoBlitz (session 97 in Metchosin's popular Talk and Walk series) covered the science and variety of the often-overlooked ascomycete mushrooms. Brought to the area by the South Vancouver Island Mycological Society (SVIMS) and the Vancouver Mycological Society (VMS), Roo spent almost two weeks in BC working in labs and helping mycological types learn more about Xylarias, an ascomycete group that occupies most of Roo's research time. 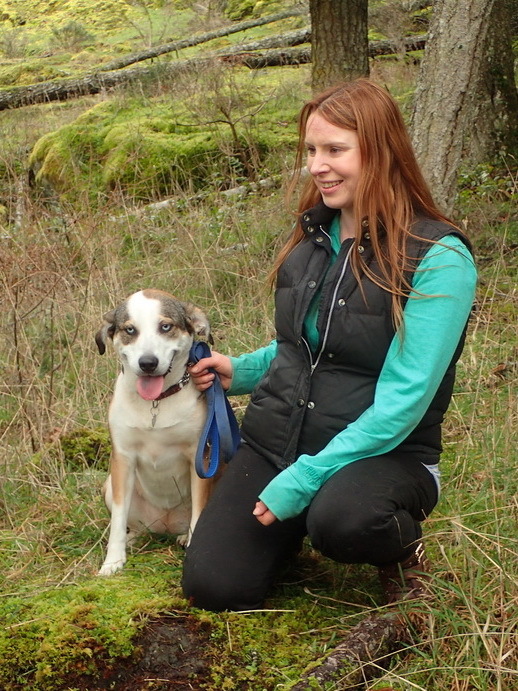 In Victoria, Roo teamed up with Dr. Brenda Callan, a colleague at the Pacific Forestry Centre. Roo and Brenda identified for the MycoBlitz more than a dozen small ascos that had not been recorded in Metchosin before. Roo examines beach driftwood for elusive ascomycetes. Picture by Luke Mikler. Click for larger version. MycoBlitz 2017 was fortunate to have on the search teams several good photographers. They have graciously agreed to make digital versions some of their pictures from the day available on this web site. To see these pictures, go to this page. Clicking on the pictures will bring up more detailed versions. Here is a list of the taxonomy experts who joined us for the 2017 MycoBlitz. 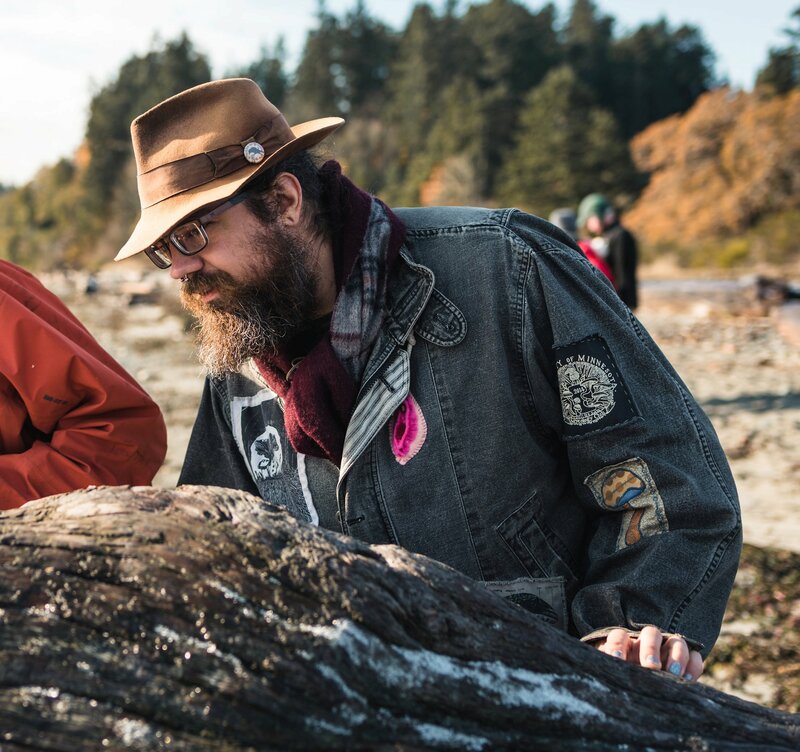 The Metchosin Biodiversity Project, organizer of the MycoBlitz, acknowledges the support of the Metchosin Foundation in helping make the Metchosin MycoBlitzes possible. 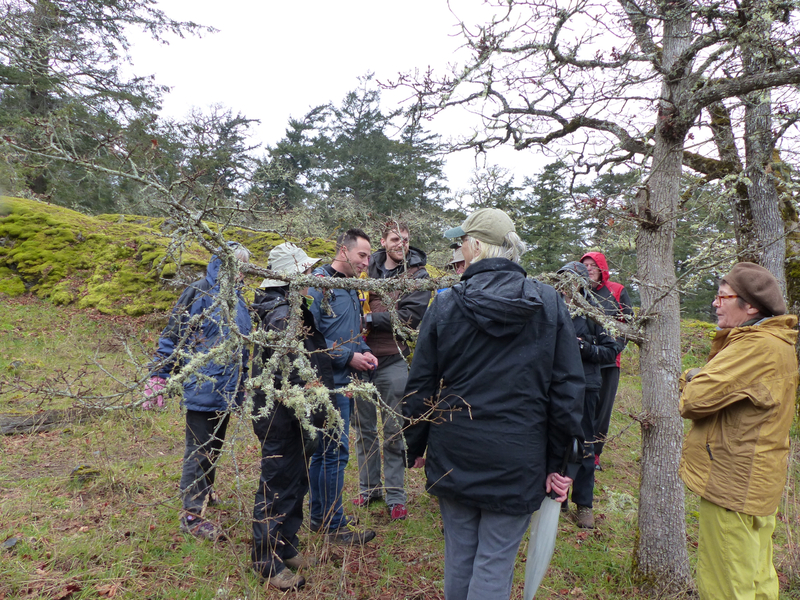 Ryan Batten, Hans Roemer, and Kem Luther, along with Jenifer Penny and Marta Donovan from the Conservation Data Centre, visited Tower Point at Witty's Lagoon CRD Park on March 7, 2017, to check out the lichens. Alas, the weather at Tower Point was not very cooperative. The group of researchers, confronted by a stinging salt spray and crashing waves, struggled to stay warm and dry enough to enjoy the lichens. 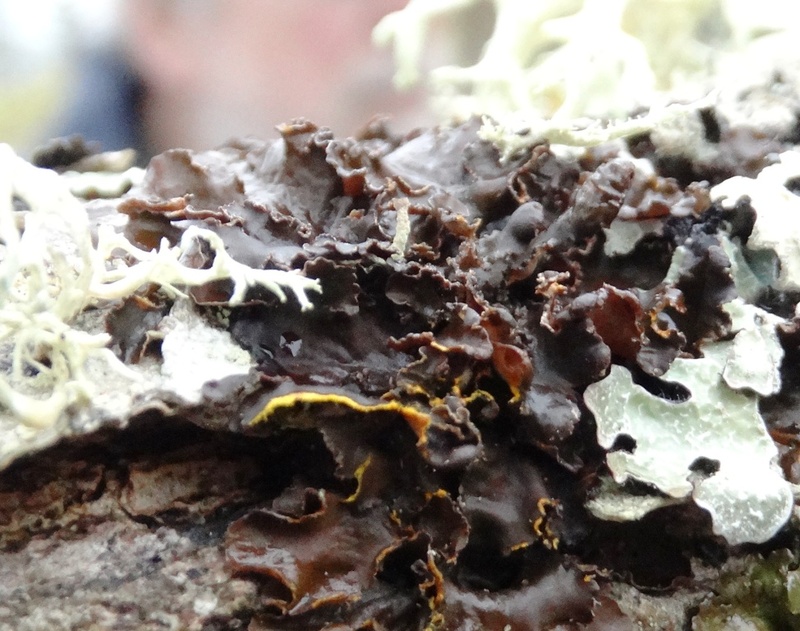 They did find a number of interesting lichens, however, and one fungus that is a symbiont on lichens (pictured above) The fungus was a new addition to the Metchosin BioBlitz database. The experience at the Tower Point site convinced the group to take the participants from the talk and walk coming up later in the week to Devonian Park. On Saturday, March 11, 2017, a group of about 15 people accompanied Ryan on this walk. 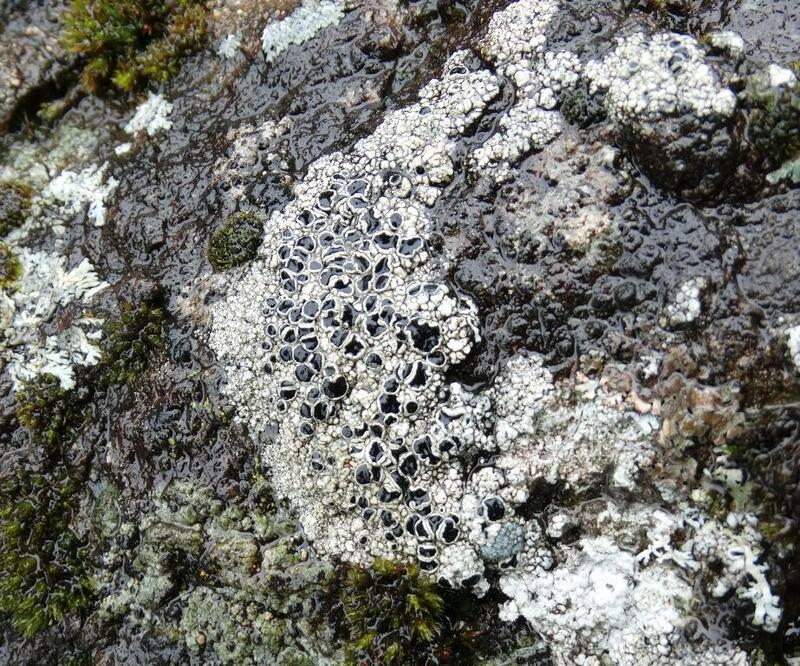 The two lichen forays to Tower Point and to Devonian added four new lichens to the BioBlitz inventory, bringing the total to 294. 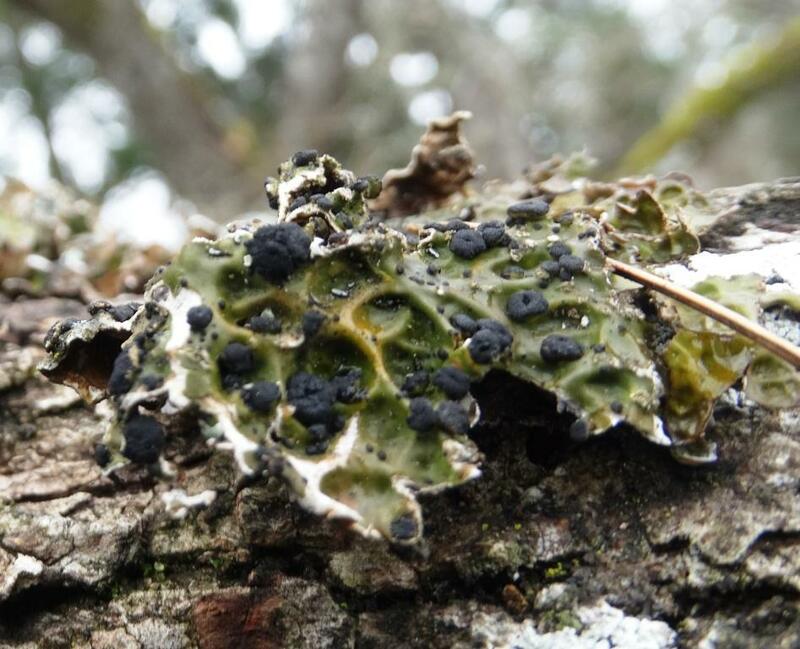 The new ones were Melanelia olivacea (Spotted Camouflage Lichen), Punctelia jeckeri (Speckled Shield Lichen), Leptogium gelatinosum (Petaled Vinyl), and Menegazzia terebrata (Tree Flute Lichen). 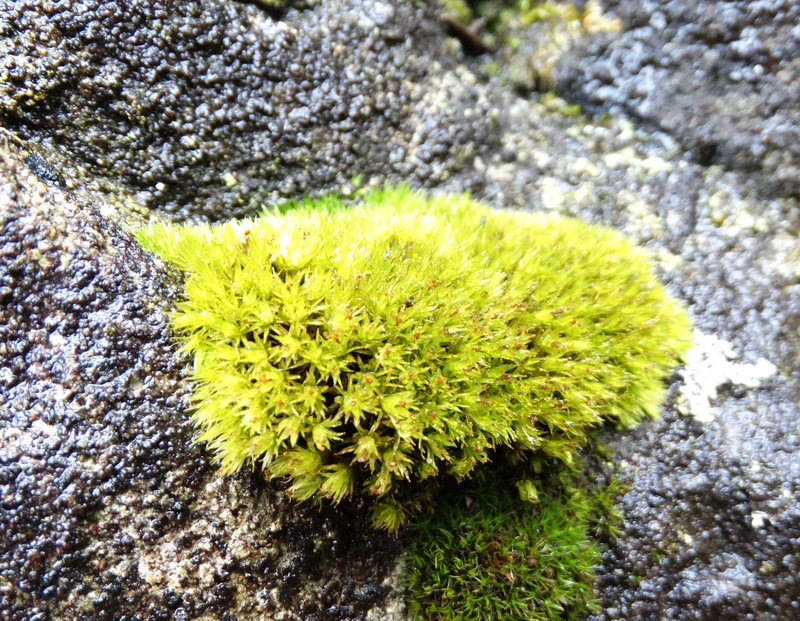 One moss and one fungus were also added. 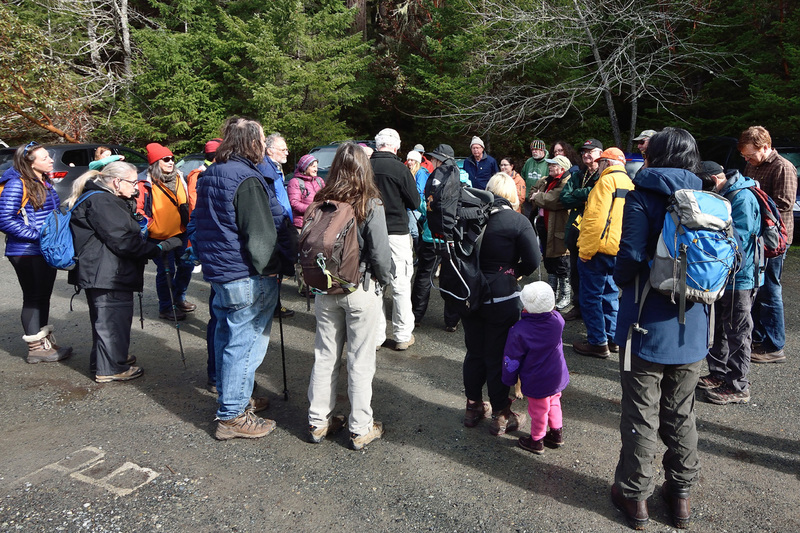 On March 4, 2017, around 35 SVIMS members joined Puget Sound Mycological Society's Danny Miller and Vancouver Mycological Society member Brooke Fochuk for a foray in the Pearson College woods. Also present at this 2017 foray were four nonhuman mushroom hunters--truffle dogs. The dogs have been specially trained to seek out underground mushrooms and point out the locations to their human controllers--a job usually done in previous centuries by truffle pigs. 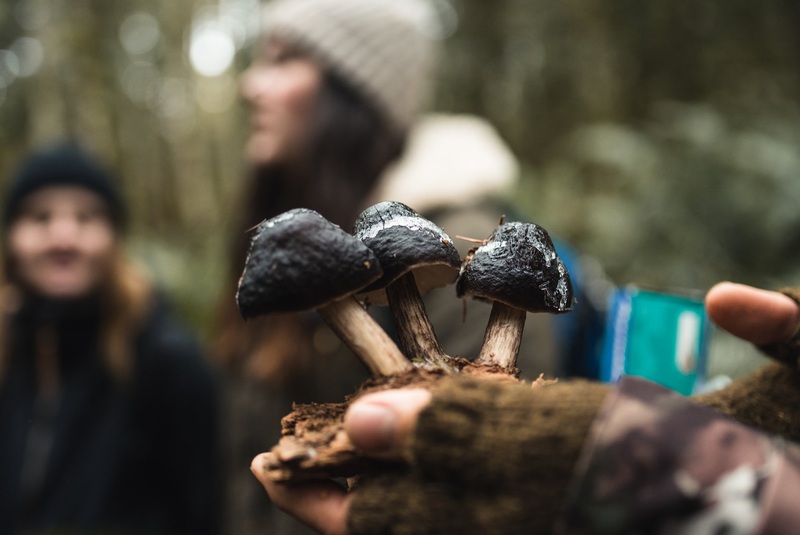 Many of the underground mushrooms in Metchosin are inedible, but a few are choice, including the Oregon White Truffle and Oregon Black Truffle. For further information on BC Truffles, see this article by SVIMS member Shannon Berch. At the Pearson event, the dogs failed to find any truffles (except the ones explicitly planted to show the dogs' ability), but everyone enjoyed watching the truffle dogs do their work. 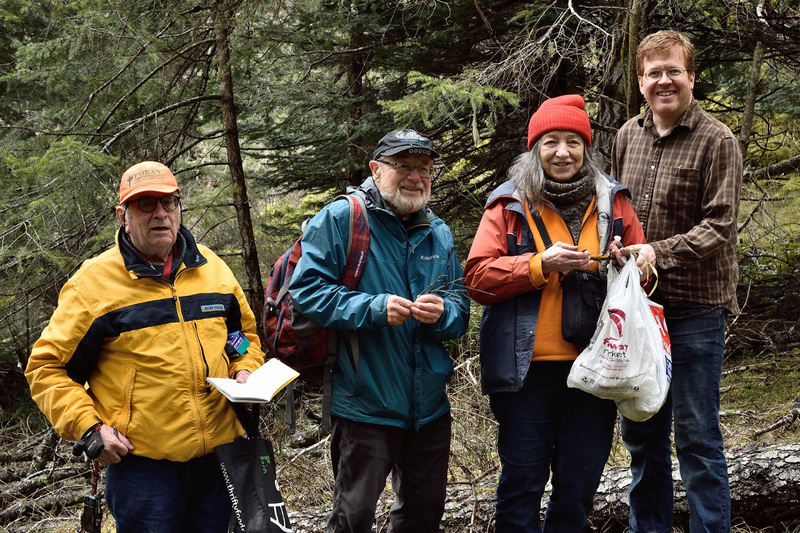 Several foray leaders, including Metchosin's own Andy MacKinnon, helped the attendees identify the mushrooms. 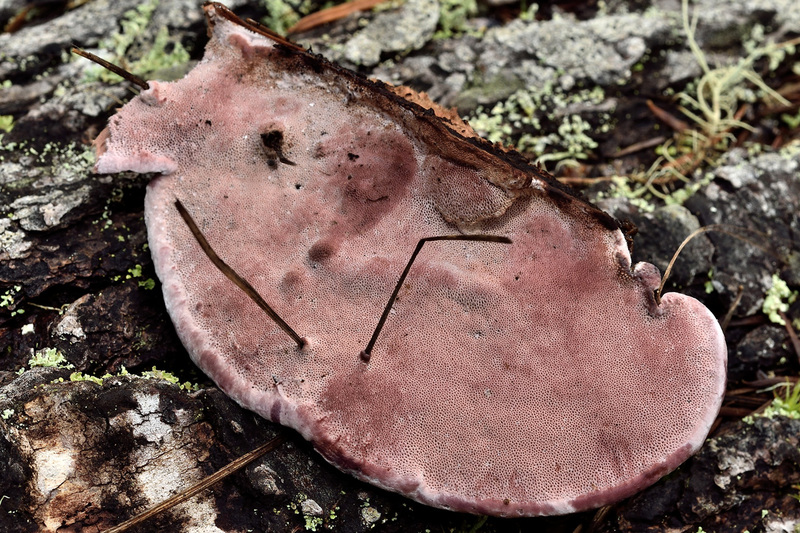 Adolf and Oluna Ceska and Bryce Kendrick later compiled a list of 45 different mushroom species found during the day. The 45 species were entered into the Metchosin BioBlitz database. A dozen of the sightings were completely new to the database. They were Arrhenia epichysium, Cladobotryum mycophilum, Coniophora puteana, Galerina dimorphocystis, Gloeophyllum sepiarium, Helvella maculata, Hypocrea sp., Leptodontidium elatius/trabinellum, Mycena parabolica, Penicillium sp., Propolis leonis, and Sarea resinae.